Get Inspired: My Before / After! Some see the World Records, race wins etc and think that I couldn’t possibly get where they are coming from. Well, believe it or not, I can! I’ve mentioned before that I had to overcome many issues to get to where I am in health, but had just posted current photos. 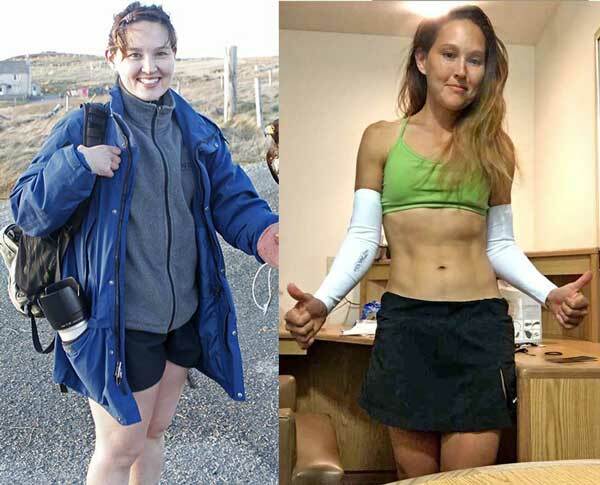 Although I believe in moving TOWARD your goals, I’m posting a before/after because many people find it inspiring. The “after” picture was taken at 2 AM before I ran the Black Canyon 100K in February. In the pic, I had just finished packing my drop boxes (haha) and in full disclosure am 6-7 lbs bloated from carb loading for the race!! As for the “before” picture… I spent a number of years dealing with poor health. Prior to that, I had been very fit, even setting the world records for multi-continent marathon running. However, I started to feel like “I can’t lose the last several pounds no matter what I try”, and had other minor symptoms bothering me. So I began to go to many doctors to try to find a cure and I sincerely now believe that, “The mind leads, and the body follows,” as my Mom has always said. If you believe something is wrong with you, your body will follow and you will find others who will confirm your self-diagnosis. Then you focus more on the problem and often, as you get what you focus on, you just get more of the problem as a result. Therefore, it got to the point that I had been what later turned out to be misdiagnosed with several ailments, some of which doctors said I would need to be on medications for the rest of my life. This included adrenal issues, thyroid problems, extreme allergies/asthma, food reactions, body aches and depression. I did run and exercise still, but I was on such high dosages of medications that my thyroid gland (which in large part controls your metabolism) was fully shut down and my heart rate would get so high that it was dangerous to run, so I had to stop. This was frustrating to me because for years I’d always loved being so active. The left photo is not even of me at my heaviest. I was so tired of my symptoms still not being under control or getting worse that I just decided to STOP going from doctor to doctor to find a solution to what I thought was ‘wrong’ with me and to take my health into my own hands. So instead I started focusing on what could be “right”!! Despite it all, I maintained the belief that I could get off all medications and be well. I decided to make changes in my lifestyle, and got off the medications. However, due to the sudden shift off medications, with my thyroid basically shut down, I then rapidly gained at least another twenty pounds (or so? I stopped weighing as I didn’t want to know). I found it even more depressing that jeans that had recently fit now didn’t, as I had already felt self-conscious about myself as well. I remember around this time I had started a new job and we had a work event on a small boat. Everyone else was eating cake, pizza etc and I had a small plate with just some celery and carrots. Some guy came up and loudly asked me, “Aren’t you the one that ran the marathons on all continents?” Before I could answer he added, in front of everyone, “Boy, you must eat a WHOLE LOT, because marathon runners are normally THIN.” I felt so embarrassed I wanted to crawl into a hole. But on the small boat there was nowhere to go while everyone laughed hard at his joke. After I got off the boat I just sat in my car and cried. Regardless I focused on remodeling my type-A lifestyle, getting better rest, and regularly mentally targeting my image of myself being healthy again. I also learned more about healthy eating with portion control (meaning not only not too much – but also not too little) alongside exercise. Even though I gained the weight mostly due to medications, I had to lose it just like anyone else. And it was very slow due to my thyroid gland having to come back to par on it’s own. Due to the high heart rate issues that had not yet gone away, I had to start with walking. I started just going down to the end of the block and back, but regardless I made a schedule and added a little bit each day. My feet, ankles and joints would hurt as my frame was not used to the weight gain. I eventually started alternating running and walking a block each at a time. Then running, very slowly. I can remember how happy I was the day that I could run my first mile all over again. I joined a running club at that point and so yes, believe it or not I know how it feels to always be the last one finishing a designated route after everyone else has finished, or even left and gone home. Some would even joke about it but I just kept going. I started running 5K races again after that, and though I finished in the lower half I was happy that I was able to do it at all. Making lifestyle changes, focusing on positive thinking and the vision of the life I wanted, consistent healthy eating and exercise were the keys to me recovering my health. I lost 50+ pounds. I am now even fitter and healthier than I was before I became sick, and have accomplished more than I had ever thought possible. I never thought I would qualify for the Boston Marathon, for example, and now I have a qualifying time with every marathon I run, even just for training. And I am off all medications!!! It can at times still be a rocky road to maintain total health as there is no such thing as perfection. However, I just keep on “Running with Life”. I still work on work-life balance and stress. However rather than always expecting a flawless life, Wellness is more about discovering your own path to health, staying on it for the long-term as well as finding strategies to get back to it when things come up. This is what sets you up for long term success. I became a Wellness Coach because I can help people find their own individual journeys to their Visions of Wellness. I am a Running Coach because it is my longtime passion and joy and I’d like more people to experience that as well. YOU can have the life YOU want. Visualize it and make it happen! If you want more inspiration check out my friend Charles Ray Bell’s story of how he went from 300 lbs to a 3 hour marathon. He was one of the people who originally inspired me to start running over 100 miles a week many years ago. 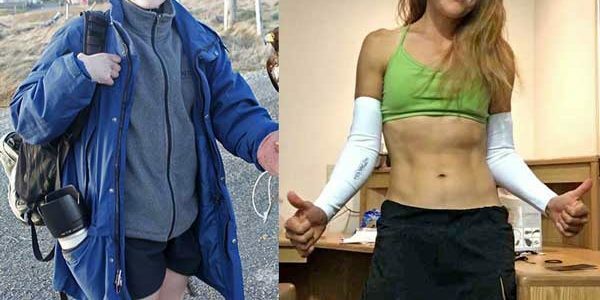 Or check out fellow Indiana resident, and ultra runner Traci Falbo’s story of how she lost 80 lbs and currently holds the American Record and World Indoor Track Record in the 48 Hour event (242.093 miles). Check out what Private Coaching can do for you or our Training Groups to start or get back into the healthy lifestyle you know you can achieve! And you can always contact me for more information on the services I can provide for you. And “Like” the Running With Life Coaching page for motivation, running and wellness articles and tips! Have a great day!! Previous post: “Have to” versus, “Get to,” or, The Power of Gratitude in Your Life! Next post: 3 Easy Steps To Choosing The Right Coach!